One of the best thing about running a comic book blog is that you get a chance to check out comics that you otherwise would skip over on the shelf. And every so often you find gems that you wish some clerk would of put in your hands. Top Cow seems to produce a lot of the comics I feel this way about. 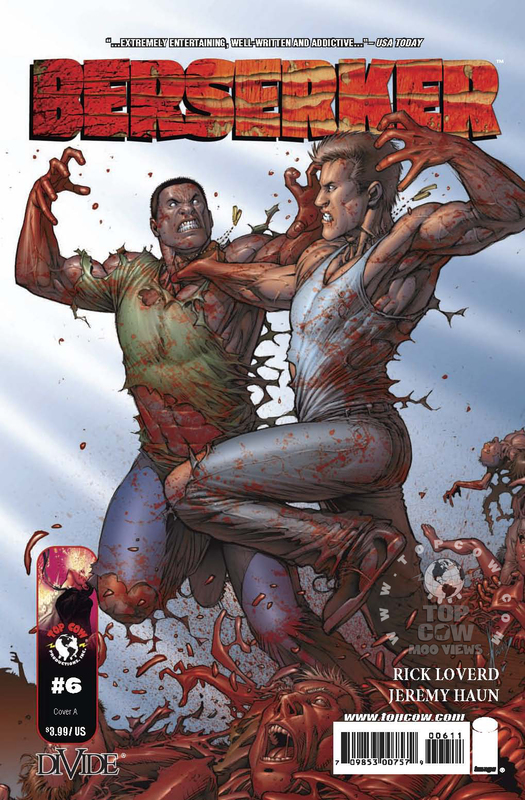 Case in point is Berserker #6, written by Rick Loverd and art by Jeremy Haun. The first story arc of the brutal new series produced by Heroes star Milo Ventimiglia and DiVide Pictures concludes this month! The battle you’ve been waiting for is here as Farris and Aaron collide in a brutal all out brawl, which threatens to bring Asgaard to rubble. If you thought things were bloody before, wait until you get your hands on this issue! The concept is familiar and you might feel like you’re reading a series about werewolves or vampires, but this one has some familiar terms you might see in a Thor comic. I can’t say I understood everything that was going on, but I got the basics which I would of normally chalked up to one giant fight scene and would of chucked the comic to the side as being nothing spectacular. However, the dialogue is great and pure entertainment. While Farris and Aaron battle, two factions (that’s about all I got) chat and watch the destruction. The banter between them was great and the most entertaining thing about the comic. It got me to laugh out loud at parts and has me intrigued enough to want to check out the first five issues. Check out below the fold for the extended review including the rating.